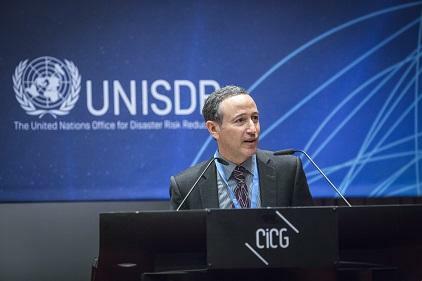 UNISDR Science and Technology Conference on the Implementation of the Sendai Framework for Disaster Risk Reduction 2015-2030, with GFMC panelist and discussant inputs (Oyunsanaa Byambasuren) to Work Stream 1 “The Scientific and Technical Partnership to support the implementation of the Sendai Framework” – Working Group 2 “Regional Science and Technology Networks and Platforms” (27 January 2016), and Work Stream 4 “Leveraging Science through Capacity Development and Research” – Working Group 3 “Research Gaps” (29 January 2016); United Nations, Geneva, Switzerland. Work visit of Global SuperTanker Services, LLC; GFMC. Consultation on operational cooperation between the UNISDR Global Wildland Fire Network (GWFN) and the UNEP / OCHA Joint Environment Unit (J.G. Goldammer); Palais des Nations, Geneva, Switzerland. Consultation on GFMC / GWFN support in the implementation of the Sendai framework for Disaster risk Reduction under UNISDR (J.G. Goldammer); UN Office for Disaster Risk Reduction, Geneva, Switzerland. 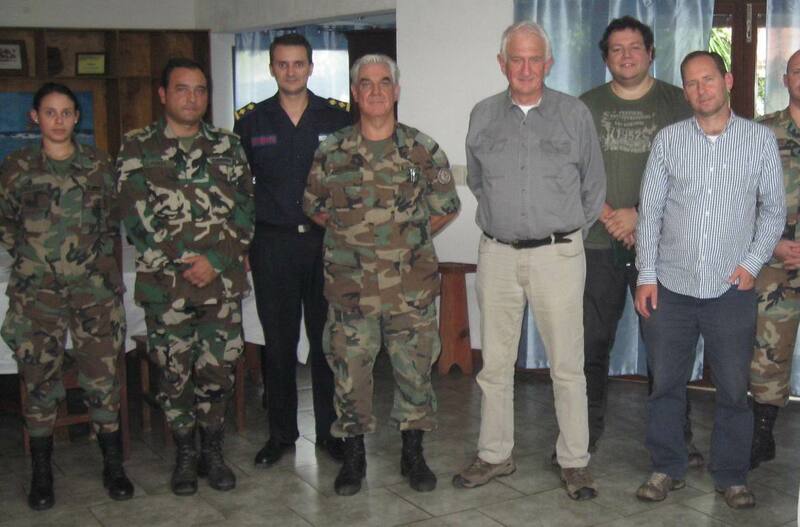 Preparatory mission for the regional Symposium on Cross-boundary Fire Management in South America (29 May – 2 June 2016) in the frame of the project “Support of National and Regional Competency in Integrated Fire Management to Secure Sustainable Forest Management in Uruguay and through Cross-border Cooperation with Brazil and other Neighbouring Countries of South America” (J.G. 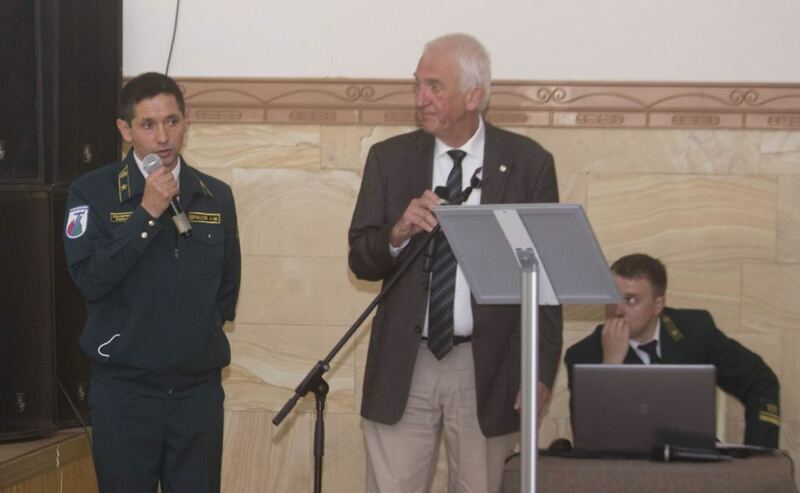 Goldammer, E. Beltran); Direccion General Forestal, Ministerio de Ganaderia Agricultura y Pesca, Direccion Nacional de Bomberos, Sistema Nacional de Emergencias and Exercito de Uruguay, Montevideo and field sites, Uruguay. 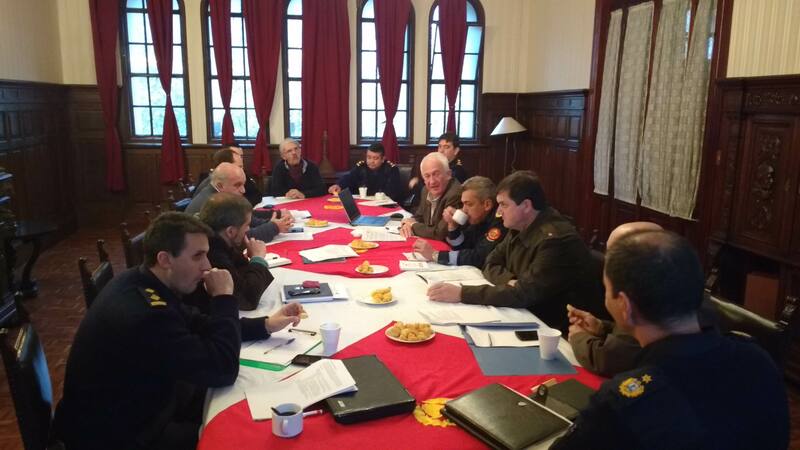 Top: Initial meeting between GFMC and the Direccion General Forestal (DGF), Direccion Nacional de Bomberos (DNB) and Sistema Nacional de Emergencias (Montevideo, 04 April 2016). Bottom: Meeting with the Organizing Committee (DGF, DNB, Ejercito de Uruguay and GFMC) at Fortaleza de Santa Teresa (05 April 2016). VII Ukraine Fire Management Week with Third Eastern European Prescribed Fire Demonstration and Long-term Observation Experiment on the use of prescribed fire for enhancing regeneration of Scots pine stands (J.G. Goldammer); Regional Eastern European Fire Monitoring Center (REEFMC), National University of Life and Environmental Sciences of Ukraine (NULESU), Kyiv and Boyarka Forest Research Station, Ukraine. 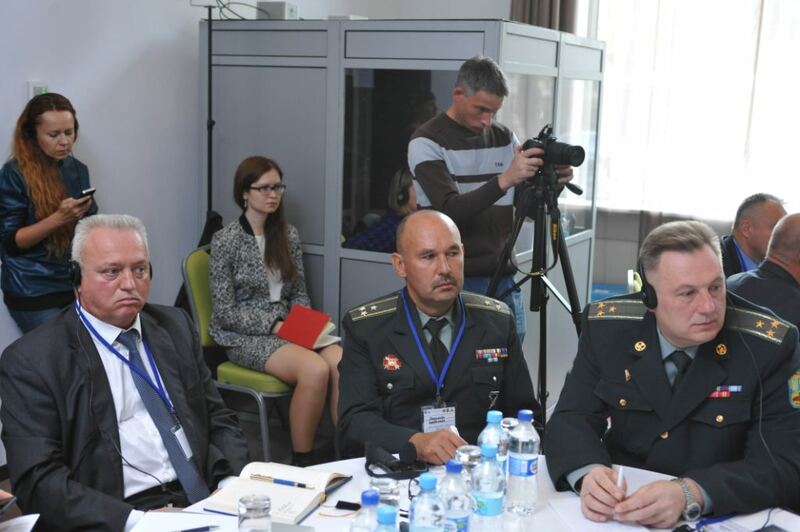 Inception Workshop of the UNEP-GEF Project “Conserving, Enhancing and Managing Carbon Stocks and Biodiversity in the Chernobyl Exclusion Zone” with the fire management component (J.G. 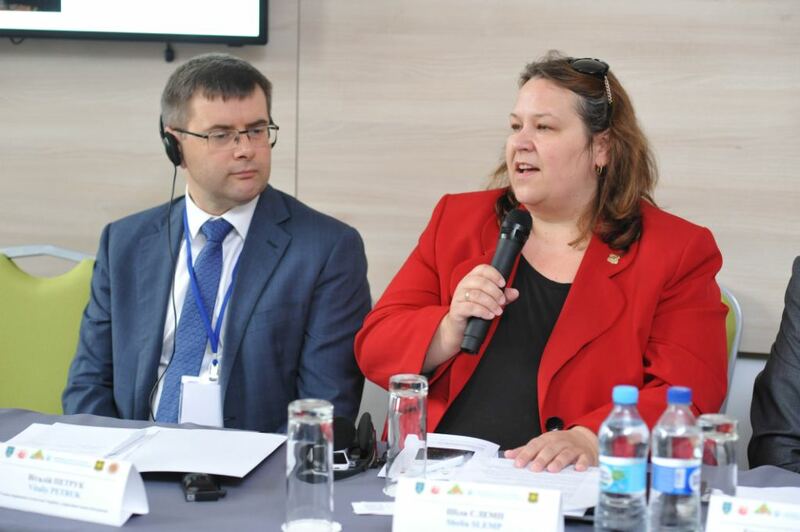 Goldammer); Ministry of Ecology and Natural Resources of Ukraine (MENR) and State Agency of Ukraine on the Exclusion Zone Management, Kyiv, Ukraine. 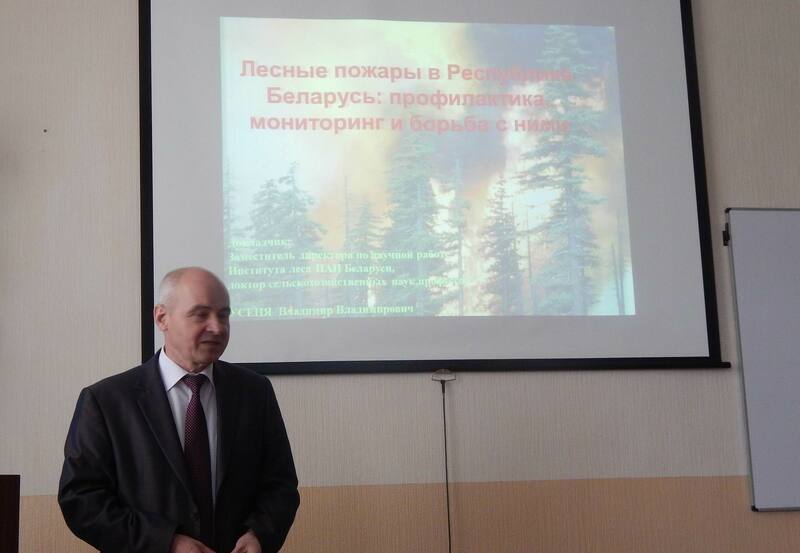 Consultation on the project “Improving radiological and environmental awareness in territories affected by the Chernobyl accident in Belarus and Ukraine with a focus on wildfire management” (J.G. Goldammer); OSCE Office Ukraine, Kyiv, Ukraine. National and Regional Inter-Agency Round Table on Fire Management in preparation of the wildfire season 2016 (J.G. Goldammer); National University of Life and Environmental Sciences of Ukraine (NULESU) / Regional Eastern European Fire Monitoring Center (REEFMC), Kyiv, Ukraine. 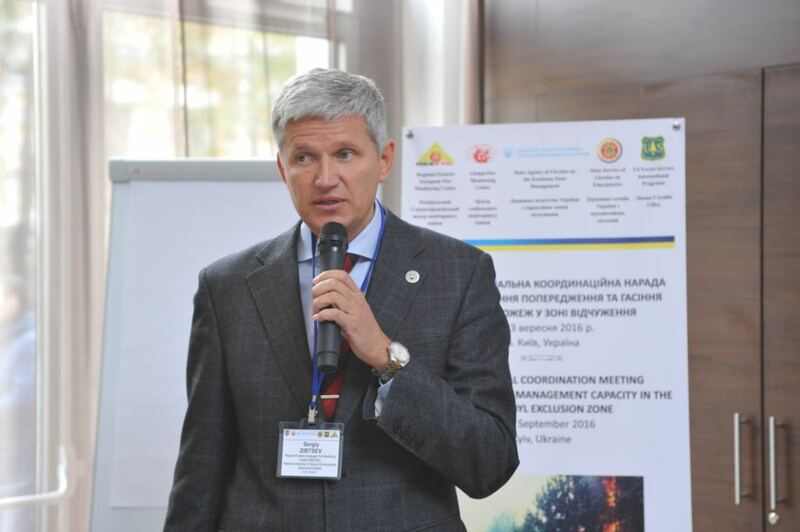 Regional and national exchange: Top: Vladimir Usenia, Institute of Forest of the Belorussian Academy of Science, Gomel, Republic Belarus, elaborated on cooperative cross-boundary fire management between Belarus and Ukraine. Middle: Audience of the Round Table. 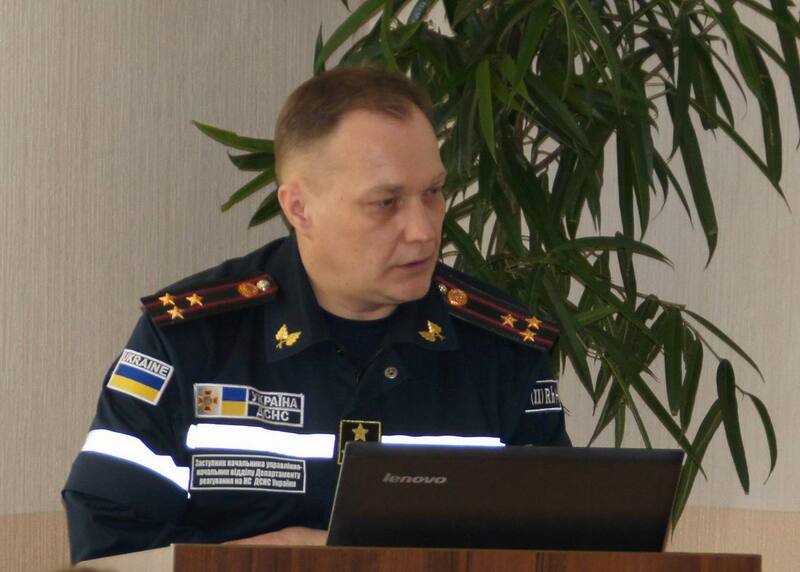 Bottom: The representative of the State Emergency Service of Ukraine reported about the fire season 2015 and the preparedness for 2016. The U.S. Department of State, Bureau of Educational and Cultural Affairs (ECA), publishes a press release announces that Mr. Jameson Karns of the University of California, Berkeley, has received a Fulbright U.S. Student Program grant to Germany in History from the U.S. Department of State and the J. William Fulbright Foreign Scholarship Board. Karns will be researching at the Global Fire Monitoring Center, Max-Planck-Institut fuer Chemie, Freiburg University, and as part of a project to chart the transatlantic history of Forestry and Fire Science. 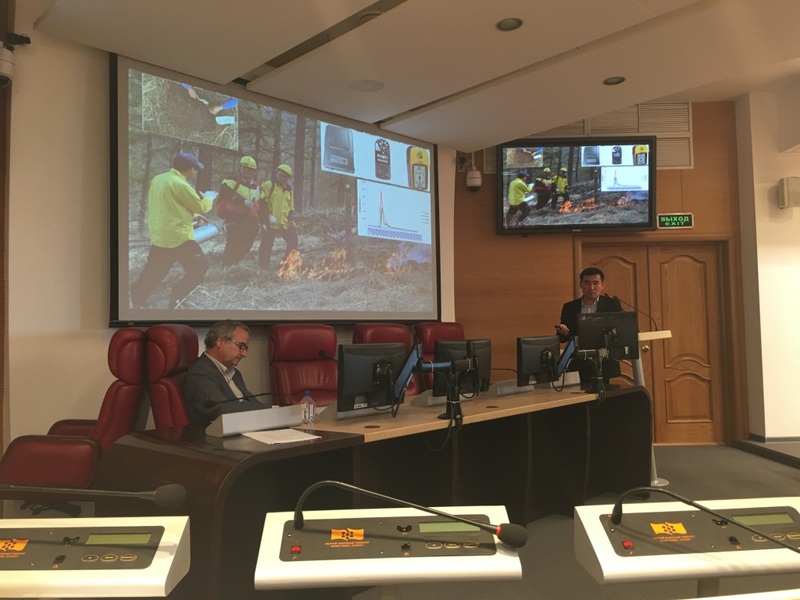 First International Fire Management Week, Islamic Republic of Iran: National Round Table on Fire Management and Training Course for on Integrated Fire Management, conducted by GFMC (J.G. Goldammer), Regional SE Europe / Caucasus Fire Monitoring Center (RFMC – N. Nikolov) and Fire Management Resource Center-Central Asia Region (FMRC-CAR – O. Byambasuren); Mazandaran, Kelarabad, Islamic Republic of Iran. The discussion for a national fire management policy included the participation of the Forest, Watershed and Rangeland Organization (FRWO) and other agencies responsible for landscape fire management (middle). 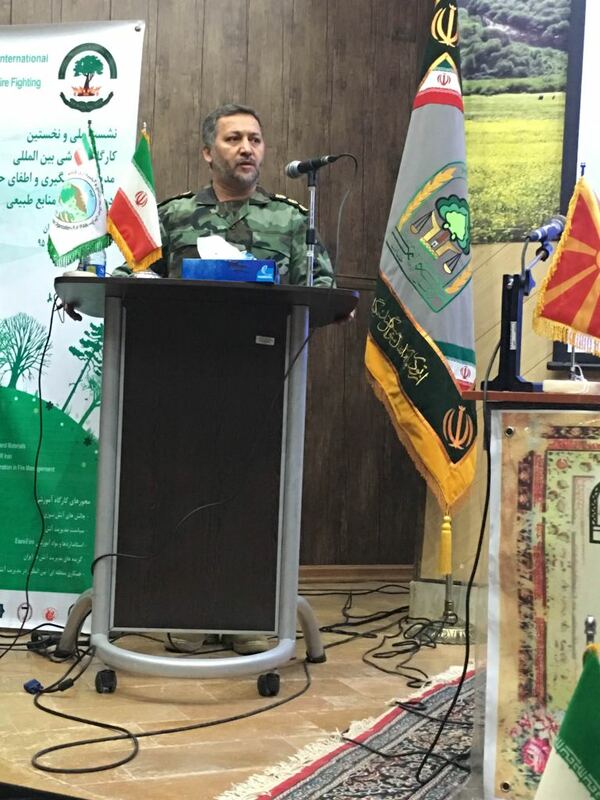 Colonel Ghasem Sabz Ali, Commander of Forest Guard (FRWO) (second to bottom), chaired the Fire Management Week. Dr. Roghayeh Jahdi (FRWO, bottom) introduced the Parsi version of the EuroFire Competency Standards and Training Materials. During the policy discussions the heads of the GFMC, RFMC and FMRC-CAR provided insight of experiences in the South East Europe / South Caucasus and Central Asia Regions and globally (top). 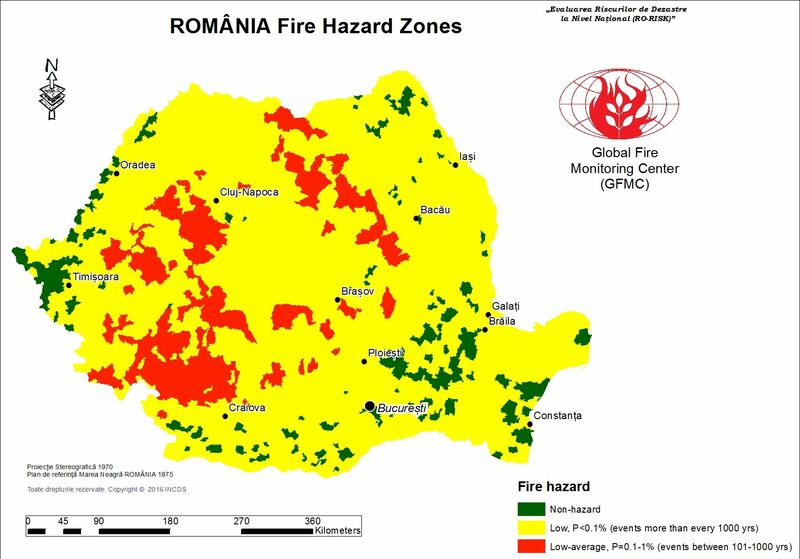 Evaluation of forest fire risk in Romania (Project “Disaster Risk Assessment at National Level – RO-RISK”) conducted by GFMC (I. Mitsopoulos, G. Mallinis); Bucharest, Bucegi Natural Park, Moroieni and Targoviste, Romania. 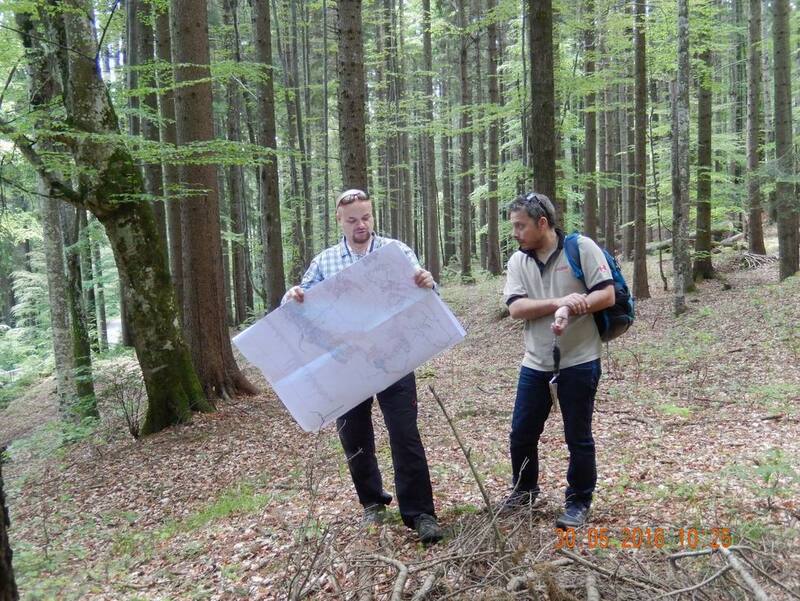 Landscape and wildfire risk aspect in Romania, wildfire hazard field assessment, one of the first project products and the Romanian-GFMC Team. 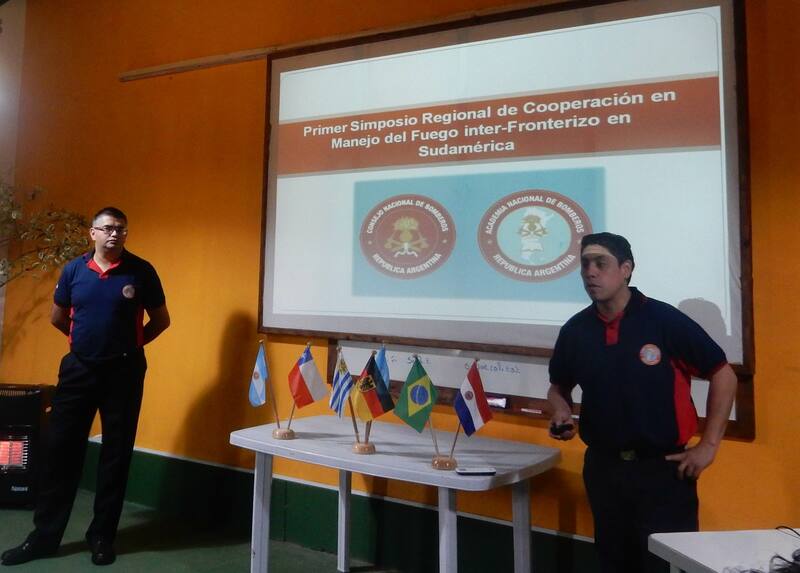 First Regional Symposium on Cross-Boundary Cooperation in Fire Management in South America / Primer Simposio Regional de Cooperacion en Manejo del Fuego Inter-Fronterizo en Sudamerica, conducted by GFMC (J.G. Goldammer) and the Regional South America Wildland Fire Network (L. Steil, E. Beltran); Parque Nacional Santa Teresa, Uruguay. National Round Table on Fire Management in Uruguay, supported / facilitated by GFMC (J.G. 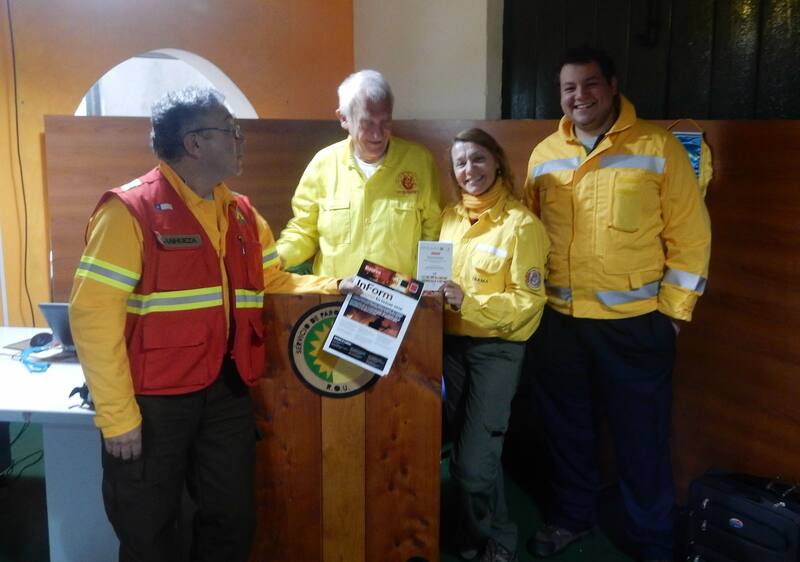 Goldammer) and the Regional South America Wildland Fire Network (E. Beltran); Direccion Nacional de Bomberos, Montevideo, Uruguay. Week of the Environment (Woche der Umwelt) at Bellevue Palace (Schloss Bellevue), residence of the President of Germany, with exhibition on the use of prescribed fire by the Federal German Forest Service and GFMC for maintaining and restoration of endangered Calluna vulgaris heathlands; Berlin, Germany. Meeting of the Open-ended Intergovernmental Expert Working Group on Indicators and Terminology Relating to Disaster Risk Reduction: Further clarity on central issues and build consensus around possible landing zones on core and critical indicators and relevant DRR terminology (with inputs by GFMC); United Nations, Palais des Nations, Geneva, Switzerland. General assembly of the German Committee for Disaster Risk Reduction (Deutsches Komitee fuer Katastrophenvorsorge – DKKV) (J.G. Goldammer); Bonn, Germany. 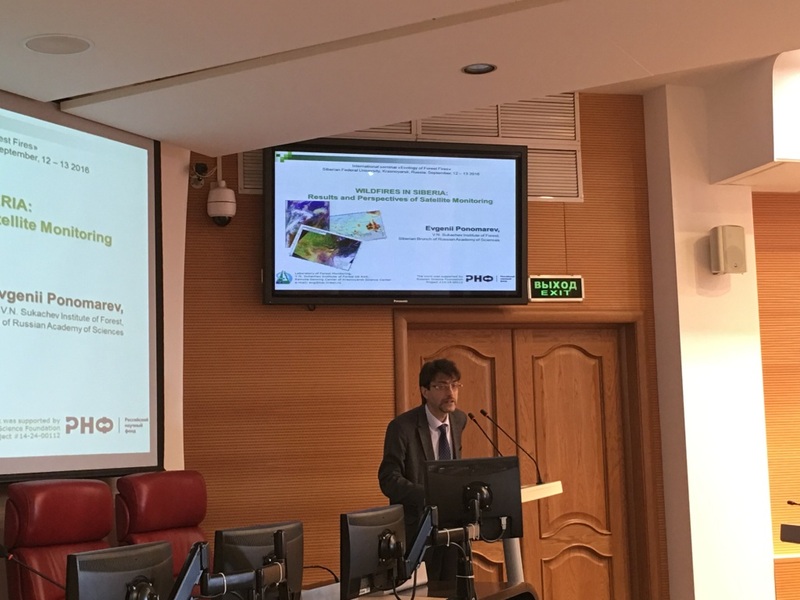 Evaluation of forest fire risk in Romania (Project “Disaster Risk Assessment at National Level – RO-RISK”): Second Scientific Meeting hosted by GFMC and Democritus University of Thrace (I. Mitsopoulos, G. Mallinis); Thessaloniki, Greece. Upper left: The scientific meeting included some hands-on training on geospatial fire risk modelling, field-trips for knowledge transfer regarding Mediterranean fuel classification and drafting a common manuscript on the resultsof the project. Upper right: Meeting scientists (from left to right): Drd. ing. Adrian Lorent, Drd. ing. Bogdan Apostol, Dr. Giorgos Mallinis, Dr. Ioannis Mitsopoulos, Dr. ing. Marius Petrila. Lower: The Romanian scientific team from the National Research and Development Institute in Forestry “Marin Dracea” was introduced through field visits into Mediterranean fuel typology and mapping and on fire risk management procedures in Greece. Photos: GFMC. Follow-up field work of prescribed burning operations on Calluna vulgaris heathlands in Eastern Germany and Western Poland during the 2001-2015 (J.G. Goldammer); Brandenburg State, Germany, and Przemkow Heath, Poland. Prescribed burning operation on Calluna vulgaris heathlands on Sylt Island, in cooperation with Sylt Nature Conservancy (Naturschutzgemeinschaft Sylt) and County Conservation Administration (Untere Naturschutzbehoerde Kreis Nordfriesland), following up the 2014 burning programme (J.G. Goldammer); Sylt Island, Germany. 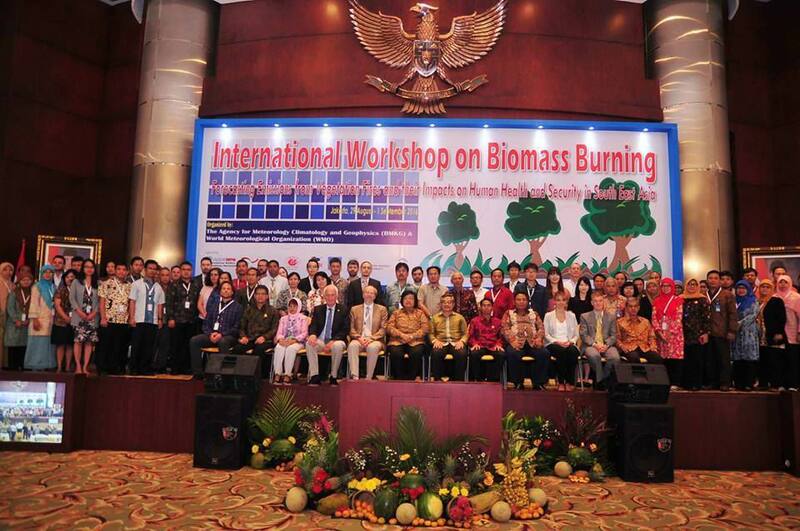 International workshop and training course “Forecasting Emissions from Vegetation Fires and their Impacts on Human Health and Security in South East Asia”, organized by WMO, IBBI, UNISDR/IWPM, GWFN/GFMC, UNU, GIZ, IGAC and BMKG: Side meetings with the Ministry of Environment and Forestry and the Peat Restoration Agency (BRG) in preparation of the planning of establishment of the Regional SE Asia Fire Management Resource Center by GFMC (J.G. Goldammer, L. Pronto); Jakarta, Indonesia. 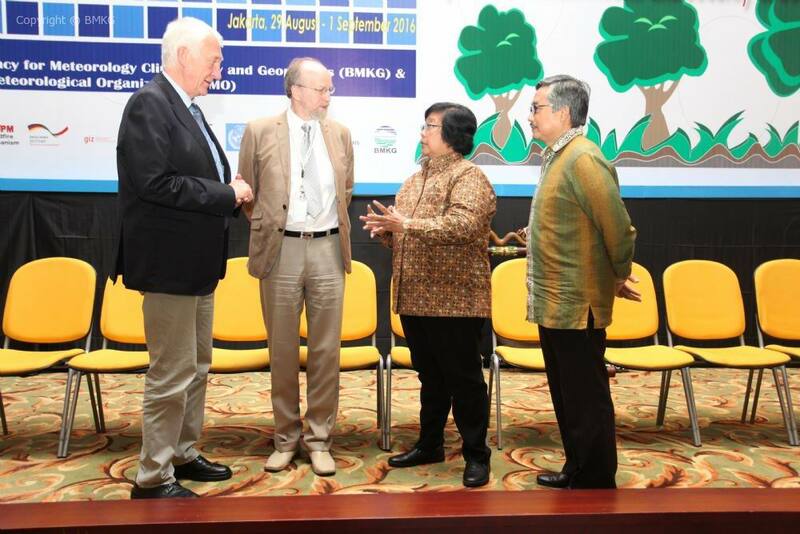 Group photo of the workshop (top); side discussion with the Minister of Environment and Forestry (Dr. Siti Nurbaya Bakar), WMO (Dr. Alexander Baklanov) and the Director General of BMKG (Dr. Andi Eka Sakya). 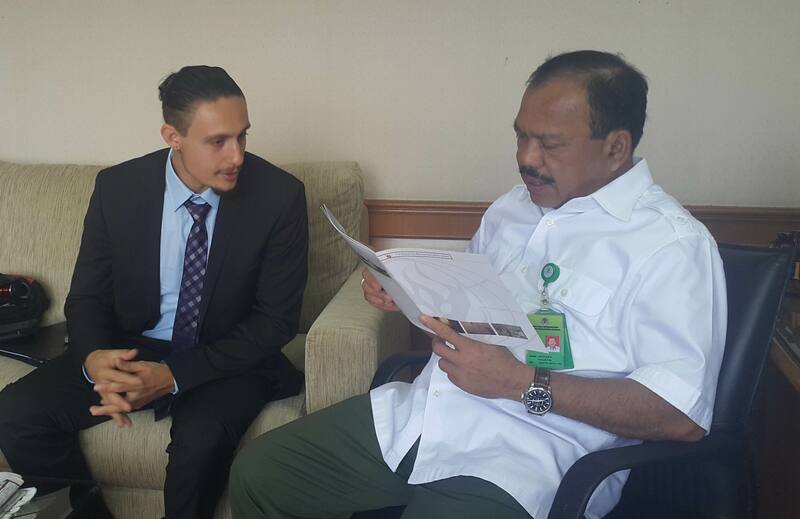 Lower left: Discussion about fire management strategy with the director of the Peat Restoration Agency (BRG), Mr. Nazir Foead, and Mr. Raffles B. Panjaitan, Forest Fire Protection Officer, Ministry of Environment and Forestry (with L. Pronto). Training Course “Enhancing Ground and Aerial Forest Fire Suppression Capacities in the Republic of Macedonia”, a joint course organized by the Regional SE Europe / Caucasus Fire Monitoring Center (RFMC), the U.S. Forest Service and the GFMC, with GFMC contribution introducing the “International Fire Aviation Guidelines and International Manual of Common Rules for Fire Aviation” (J.G. Goldammer); preparation of the National Round Table on Fire Management, Republic of Macedonia and the Regional Consultation on Cross-boundary Cooperation in Fire Management (to be held in Skopje, 09 and 11November 2016) under sponsorship of the Council of Europe (CoE), Secretariat of the Euro-Mediterranean Major Hazards Agreement (EUR-OPA); Skopje, Republic of Macedonia. 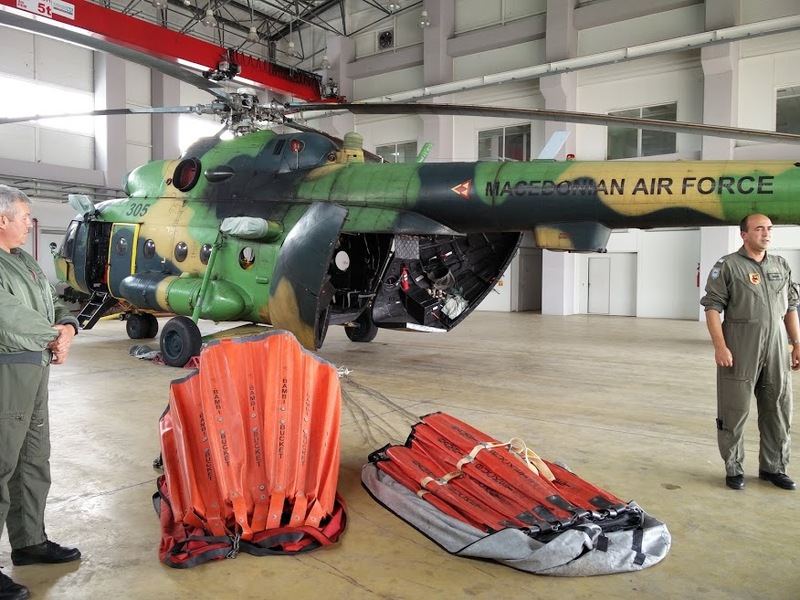 Air-ground coordination in wildfire suppression operations: Display of fixed-wing and helicopter aerial fire suppression capabilities at Skopje Airbase, training course and resource persons GFMC (J.G. 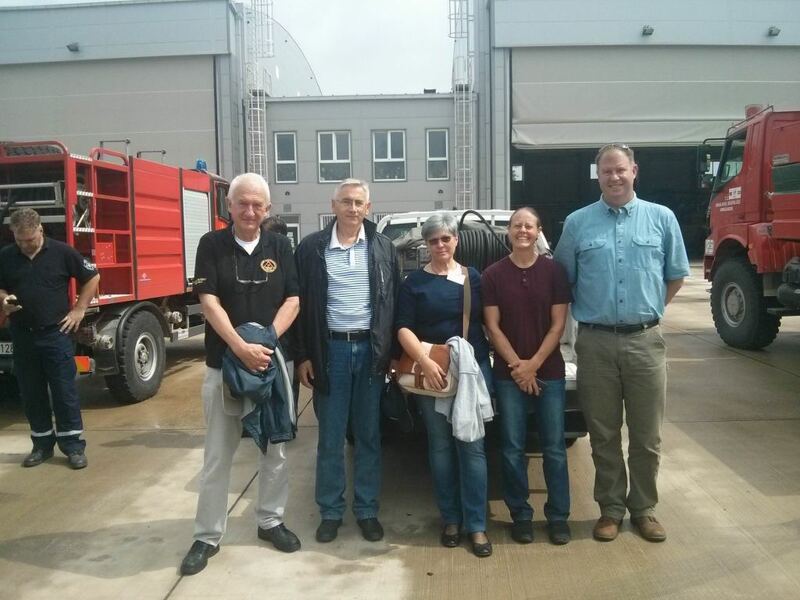 Goldammer), RFMC (N. Nikolov), Serbia (V. Jovanovic), U.S. Forest Service (R. Kuehner and B.R. Warren). Photos: RFMC and R. Kuehner. International Scientific Workshop “Ecology of Forest Fires”, with GFMC contributions presented by Oyunsanaa Byambasuren: (1) Fire ecology of forest and steppe ecosystems of Mongolia: State of knowledge and research (O. Byambasuren); (2) Example of international and cross-disciplinary fire ecology research in Central Eurasia: The Bor Forest Island Fire Experiment (Krasnoyarsk Region, Russian Federation) (J.G. Goldammer and O. Byambasuren); (3) “Wildland fire science at the fire management and policy interface in Central Asia: The Regional Central Asia Wildland Fire Network and the newly established Fire Management Resource Center – Central Asia Region (FMRC-CAR)” (O. Byambasuren); and (4) “Bringing wildland fire science to fire management application and policy decision support” (J.G. Goldammer and O. Byambasuren) and participation at the International Round Table (O. Byambasuren); Siberian Federal University, Krasnoyarsk, Russian Federation. Work visit and briefing of Government Delegation, People’s Republic of China: Forest Fire Management Office, Forestry Bureau of Sichuan Province, with representation of Forestry Bureaus of Zigong City, Aba Prefecture, Jinyang County, Jiange County and of Xingwen County; GFMC. 85th Anniversary of the Aerial Forest Fire Center Avialesookhrana and 25th Anniversary of cooperation between GFMC and Avialesookhrana, with consultations on continuing cooperation between Avialesookhrana and the GFMC (J.G. Goldammer); Pushkino, Moscow Region, Russian Federation. All-Russian Scientific Conference with International Participation “Intensification of Russian Forestry: Problems and Innovative Solutions”, with GFMC contribution “Need for the development of pragmatic and science-based solutions for forest management and fire management for the Russian Federation” (J.G.Goldammer, A.M.Eritsov and Ye.K.Kisilyakhov); V.N. Sukachev Institute of Forest SB RAS, Krasnoyarsk, Russian Federation. 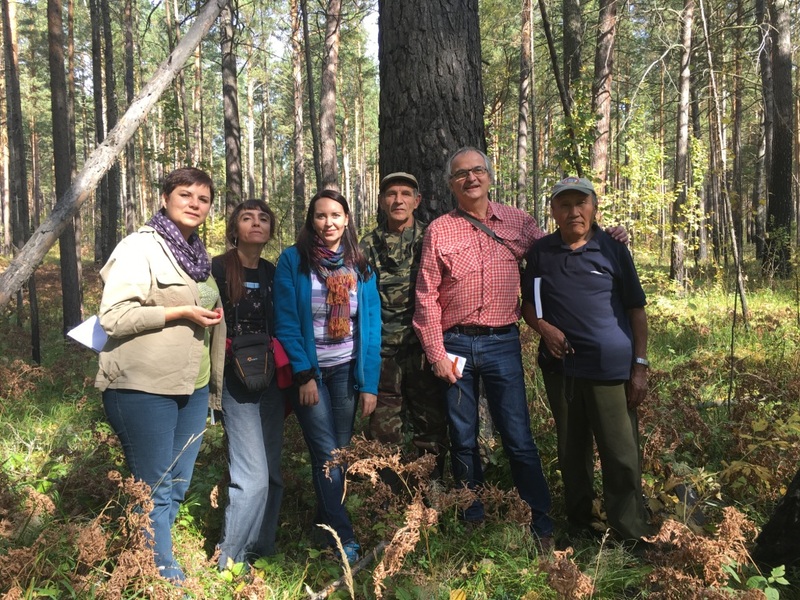 Forest and wildland fire scientists and managers developed science-based proposals and visions for the future of forestry in Russia. Photo: Sukachev Institute of Forest. First National Coordination Meeting on Enhancing Fire Management Capacity in the Chernobyl Exclusion Zone, a cooperative meeting organized by the Regional Eastern European Fire Monitoring Center (REEFMC), the U.S. Forest Service and the GFMC, with GFMC contribution on theInternational Wildfire Preparedness Mechanism (IWPM) and theEuroFire Competency Standards; preparation of the National Round Table on Fire Management, Ukraine, and the Regional Consultation on Cross-boundary Cooperation in Fire Management (to be held in Kyiv in 2017) under sponsorship of the Council of Europe (CoE), Secretariat of the Euro-Mediterranean Major Hazards Agreement (EUR-OPA) (J.G. Goldammer); Kyiv, Ukraine, 22-23 September 2016. From top to bottom: Participants of the Coordination Meeting; introductory remarks by Petro Lakyda (National University of Life and Environmental Sciences of Ukraine), Johann G. Goldammer (GFMC), George Kent (Deputy Chief of Mission, Embassy of the United State to Ukraine), Sergiy Zibtsev (REEFMC), Vitalii Petruk (Head of the State Agency of Ukraine on the Exclusion Zone Management), Shelia Slemp (U.S. Forest Service International Programs), and the audience from different ministries and agencies of Ukraine. Photos: REEFMC / NULESU. 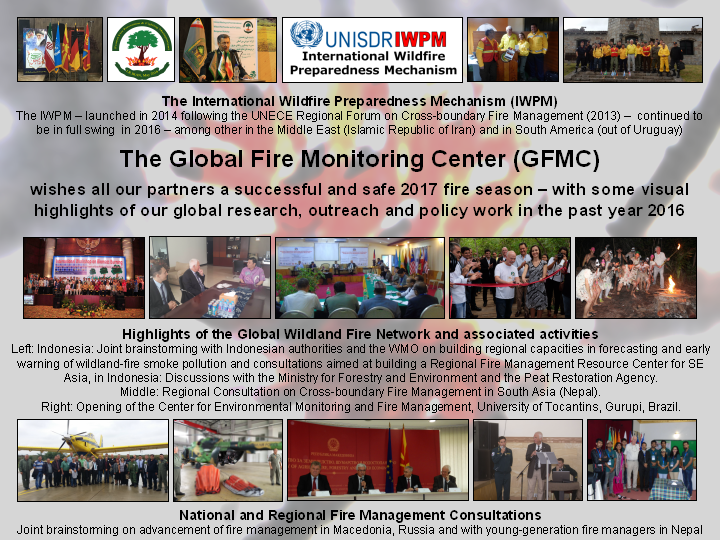 Regional Consultative Workshop on Cross-Boundary Cooperation in Fire Management in South Asia, with GFMC contributions on the introduction of EuroFire Competency Standards to South Asia and the establishment of the Regional South Asia Fire Management Resource Center (J.G. Goldammer); Lalitpur, Nepal. The participants of the regional consultation enjoying the magnificent background of the Himalayan foothills. Dangerous Goods Day 2016 (Gefahrguttag 2016), Sachsen Anhalt State, organized by the Industrie- und Handelskammer Magdeburg, at the Dienstleistungen im Brand- und Katastrophenschutzfall (DiBuKa) (Services for Fire and Disaster Management, Seehausen, Germany), with GFMC contribution “Vegetation Fires on Terrain Contaminated by Dangerous Goods” (J.G. Goldammer); DiBuKa, Seehausen, Germany. Demonstration of the fire control capabilities of the DiBuKa SPOT-55 fire suppression tank. 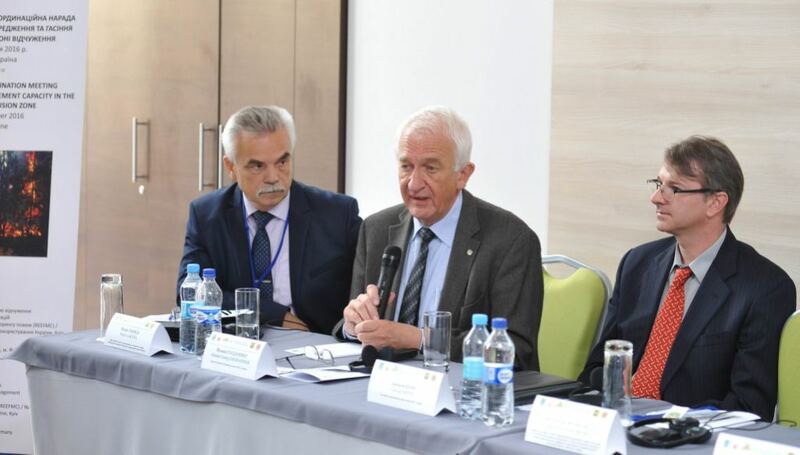 National Round Table on Fire Management, Republic of Macedonia, held under sponsorship of the Council of Europe (CoE), Secretariat of the Euro-Mediterranean Major Hazards Agreement (EUR-OPA) (facilitator: GFMC / J.G. Goldammer); Skopje, Republic of Macedonia. 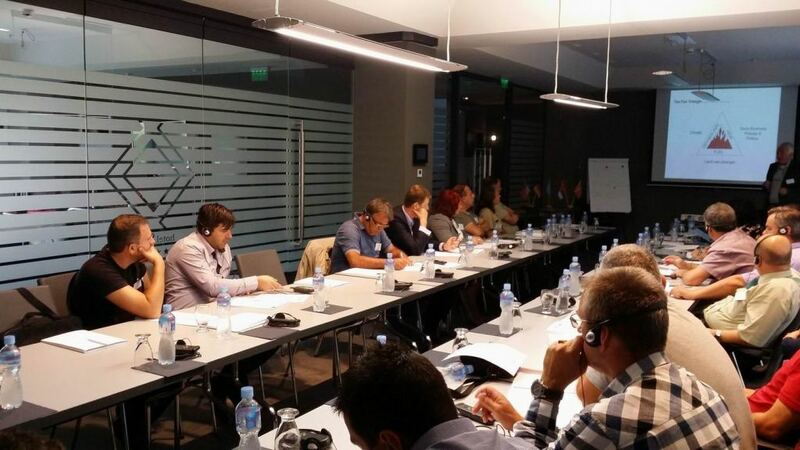 Regional Consultation on Cross-boundary Cooperation in Fire Management, heldunder sponsorship of the Council of Europe (CoE), Secretariat of the Euro-Mediterranean Major Hazards Agreement (EUR-OPA) (facilitator: GFMC / J.G. Goldammer); Skopje, Republic of Macedonia. 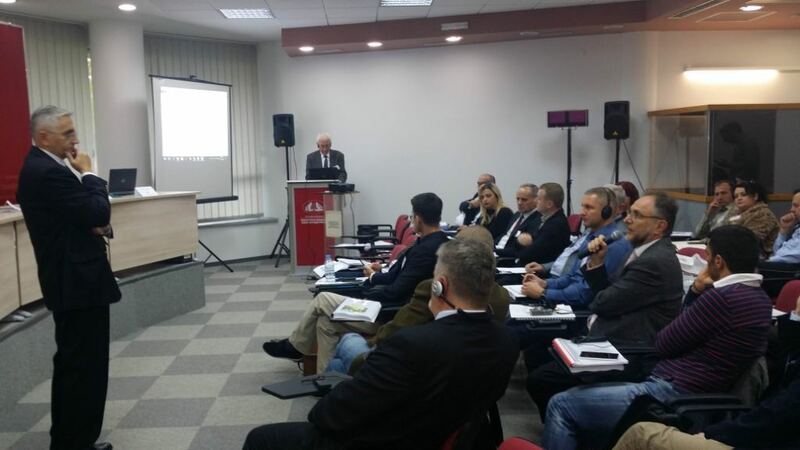 Opening of the Regional Consultation by the Minister for Agriculture, Forestry and Water Economy, Mr. Mihail Cvetkov, followed by presentations and discussion with representatives of agencies from Albania, Bulgaria, Greece, Kosovo, FYR Macedonia and Serbia. GOFC GOLD Fire Implementation Team (GOFC Fire IT) Meeting in the frame of the Forestsat 2016 conference, with a contribution of theGlobal Wildland Fire Network and theRegional South America Wildland Fire Network (presented on behalf of GFMC by Patricio Sanhueza, Chief, Operations Section, Fire Control Department, National Forestry Cooperation CONAF; Santiago, Chile. GOFC-GOLD Fire Implementation Team in Santiago. Left: Patricio Sanhueza. 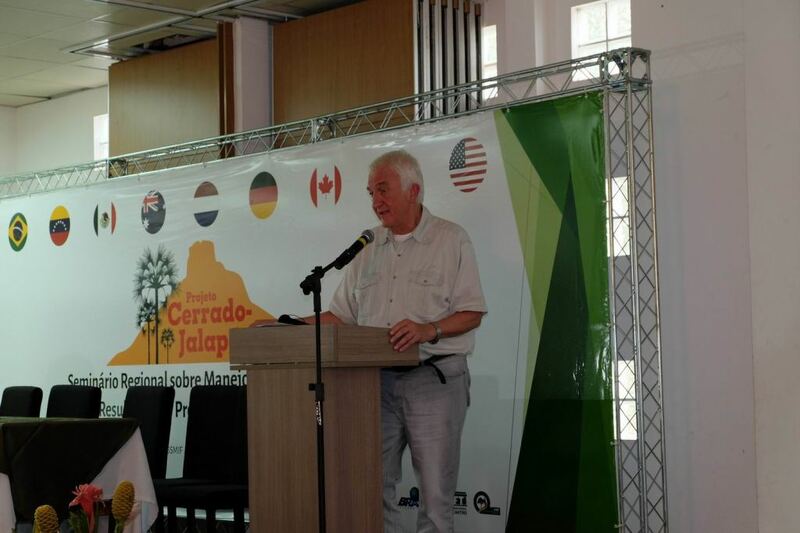 Regional Seminar on Integrated Fire Management in Tocantins: At this seminar the results of the Project Cerrado Jalapao were presented, discussed and further steps agreed upon. A highlight of the seminar was opening of the Centro de Monitoramento Ambiental e Manejo do Fogo (Center for Environmental Monitoring and Fire Management); Federal University of Tocantins, Center of Environmental Monitoring and Fire Management, Gurupi, Brazil, 22-23 November 2016. 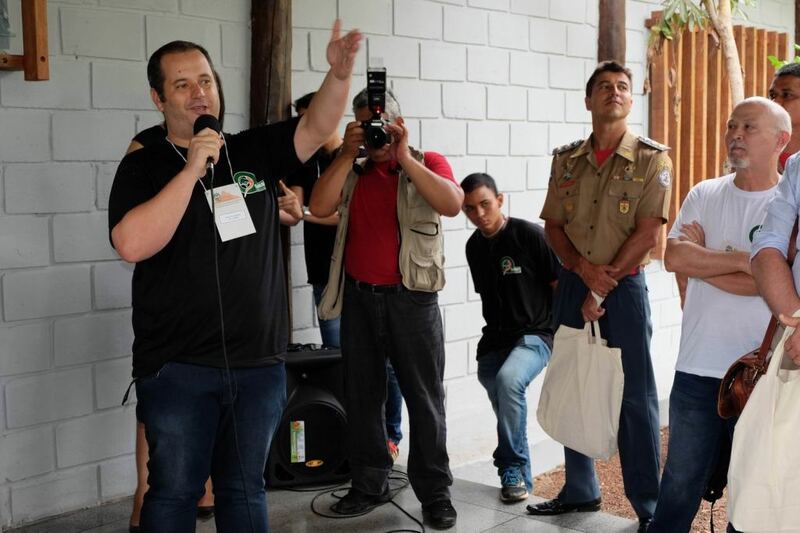 Involvement of institution and agencies of the State of Tocantins and its capital Gurupi revealed a high interest, engagement and advances made in bringing principles of Integrated Fire Management (IFM) to practice. 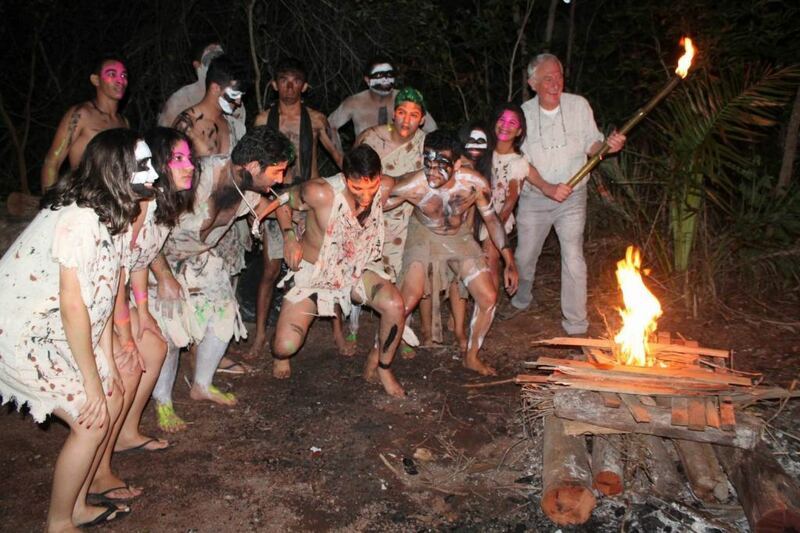 In the frame of the Regional Seminar the Secretary for Environment of the State of Tocantins Opening of the Centro de Monitoramento Ambiental e Manejo do Fogo (Center for Environmental Monitoring and Fire Management) with ceremonies of ribbon-cutting and a night performance of humans detecting fire. Photos: Center for Environmental Monitoring and Fire Management. Annual meeting of the Directors of the European and Mediterranean Centres of the EUR-OPA Major Hazards Agreement Meeting (EUR-OPA) (Open Partial Agreement on the Prevention of, Protection Against, and Organization of Relief in Major Natural and Technological Disasters), Council of Europe (N.N. Nikolov / RFMC SE Europe / Caucasus, for J.G. Goldammer); Council of Europe, Paris, France. Leadership of the EUR-OPA Secretariat and the moderator of the meeting. From left to right: Gianluca Silvestrini (new Executive Secretary of the EUR-OPA Major Hazards Agreement), Frances Pla Castelltort (Deputy Executive Secretary), Meeting Chair (European Centre on Urban Risk – CERU) (Lisbon, Portugal); Eladio Fernandez-Galiano (Head, Democratic Initiatives Department), and Mechthilde Fuhrer (Deputy Executive Secretary). 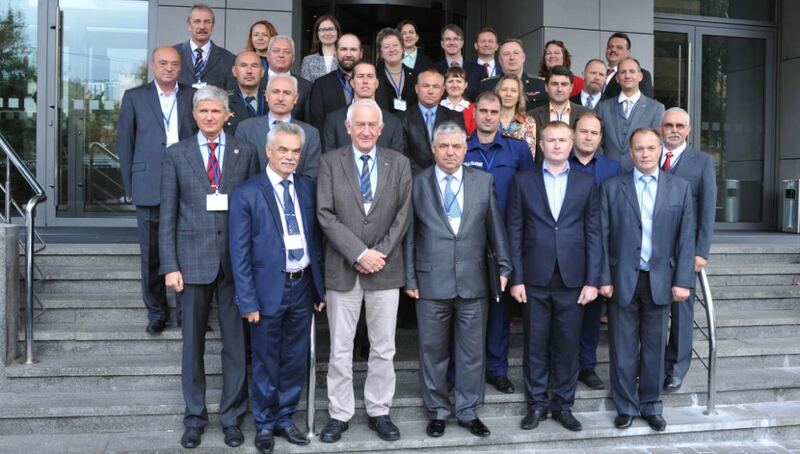 Second National Coordination Meeting on Enhancing Fire Management Capacity in the Chernobyl Exclusion Zone, a cooperative meeting organized by the Regional Eastern European Fire Monitoring Center (REEFMC), the U.S. Forest Service and the GFMC, with GFMC contribution on theInternational Wildfire Preparedness Mechanism (IWPM) and theEuroFire Competency Standards (J.G. Goldammer); preparation of the National Round Table on Fire Management, Ukraine, and the Regional Consultation on Cross-boundary Cooperation in Fire Management (to be held in Kyiv in 2017) under sponsorship of the Council of Europe (CoE), Secretariat of the Euro-Mediterranean Major Hazards Agreement (EUR-OPA); Tuirya Pasika, Trans-Carpathian Region, Ukraine. Annual course “Fire Ecology of Tropical, Subtropical and Temperate-Boreal Forest Ecosystems”, Faculty of Environment and Natural Resources, Institute of Forest Science, Freiburg University, Freiburg University (Germany), given by GFMC staff (J.G. Goldammer, L. Pronto, J. Karns); GFMC / Freiburg University, Germany. Europe Briefing and Consultation on the 2017 Global Platform for Disaster Risk Reduction “Engaging Stakeholders in Delivering the 2017 Global Platform Outcomes” (J.G. Goldammer); United Nations, Palais des Nations, Geneva, Switzerland. 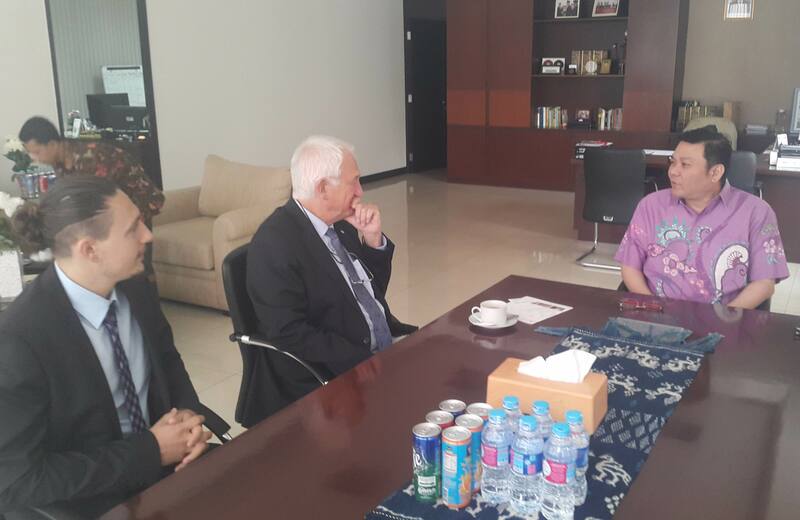 Work visit and exchange with Mr. John Karns, Chief, Fire & Rescue, Ashland (Oregon, U.S.A.); GFMC. In the GFMC library: Ashland Fire & Rescue Chief John Karns (left) with GFMC staff Lindon Pronto and with GFMC staff Jameson Karns and GFMC Chief Johann G. Goldammer.